The goalkeepers and gloves has often been overlooked. This is something that Nike wants to change, and by introducing their brand new Nike Mercurial Touch Elite, you could say that they have changed the entire goalkeeper game. Are you still as hyped as the first time you saw these gloves? Then let’s go in depth and learn more about the new strapless gloves! Many of us at the Unisport HQ didn’t really believe the pictures that we saw, when Nike introduced these new gloves, and some of us still can’t believe that they soon also will be available. A whole new glove with some technologies that’s never been seen before. We are more than certain that these strapless goalkeeper gloves are going to redefine what goalkeeping is and will be in the future. Football boots and apparel has been updated and redesigned a lot throughout the last 20 years. But goalkeepers and their gloves has been forgotten. This is something that Nike wants to change. Nike wants to give the goalkeepers something nice and put some more spotlight on them. Basically, Nike took all the things that “gloves are supposed to have” and combined this with the learning from other gloves from sports such as surfing, baseball, American football and golf. This lead to a goalkeeper glove that removed all the things which aren’t needed in the modern game of football. Forget everything about straps, bulky paddings, multiple components and so on. The Nike Mercurial Touch Elite has none of these things which gives a more minimalistic design, but packed with a lot of new innovations. 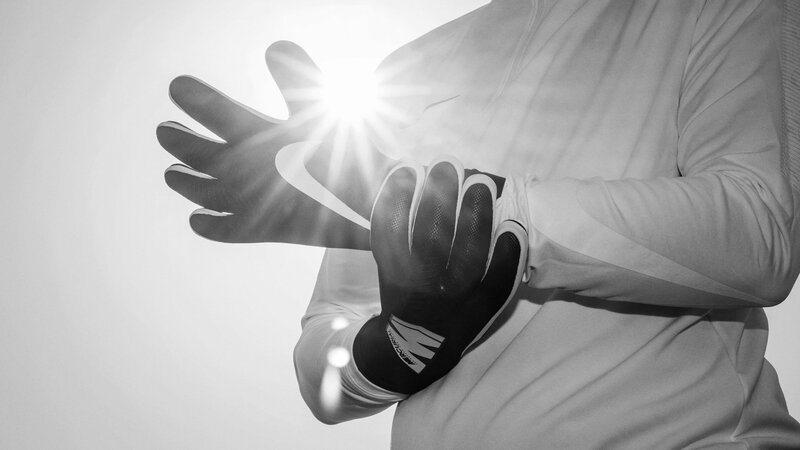 The glove is made with a high-grip palm which features Nike’s ACC (All Conditions Control). The high-grip palm supports you when saving the ball and during the distribution of the ball, making it easier for you to control the ball during different conditions. One of the most eye-catching changes is that the traditional strap has been removed, and instead a flexible wrist cuff is added. The wrist cuff is extended from the joint to the lower forearm, and this offer you more mobility and comfort. Looking at the glove it might seem a bit squishy and you might think “Where is the protection”. To give some protection Nike has implemented so called Punch prints on the third and fourth knuckle. The Punch prints lay close to the hand and provides a barrier for protection and adding power to when boxing the ball out of the penalty area. But to give this unique look and fit, Nike has chosen to make a minimalistic design and removing a lot of traditional thinking. The glove is actually reduced with 66% regarding to components than previous gloves. This means that padding on the backhand isn’t used anymore, making the glove 33% lighter and 47% thinner. Can’t wait to get your own pair of the Mercurial Touch Elite Goalkeeper gloves? Then stay tuned until May where the gloves will be released!